Brasserie Ambassade offers breakfast, lunch and dinner service and specializes in French cuisine. Opt to order meals a la carte or from its 3 course tasting menu. Some items on the menu at Brasserie Ambassade include steak tartare, seabass and duck confit. A wide selection of cocktails, wines and champagnes are available. 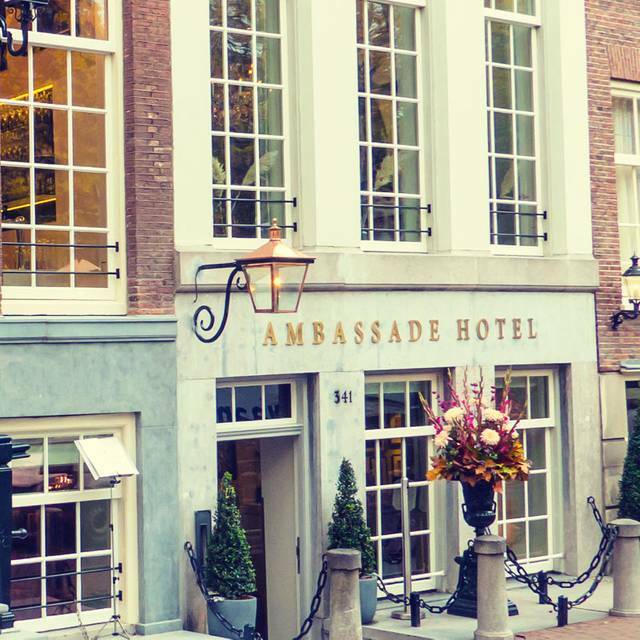 You'll enjoy a stylish and contemporary décor when dining at Brasserie Ambassade, combined with excellent service. Featuring sparkling chandeliers, comfortable bench seating, a library room and elegant Cobra artworks throughout, it provides an upscale ambience. Large windows further provide for canal views and enhanced sunlight. A bientot! My husband and I had a wonderful evening at this restaurant. The host showed us to a lovely table by the window. 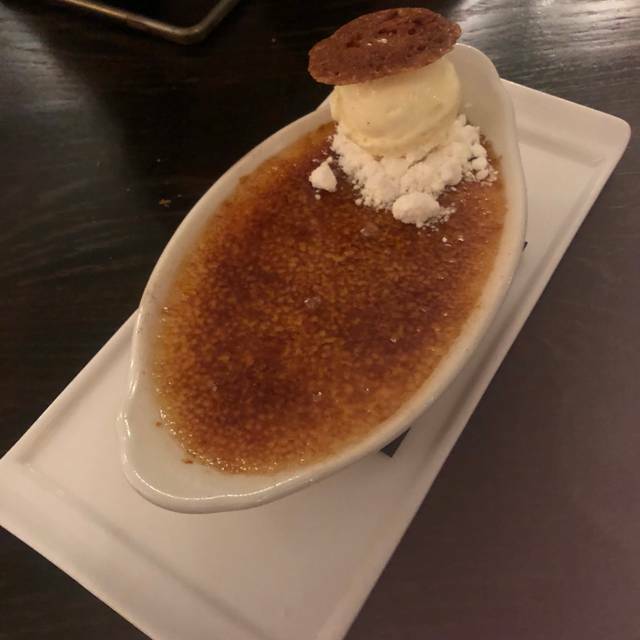 We enjoyed a delicious dinner and dessert. Will definitely be back the next time we are in Amsterdam. The location, service and food was amazing. 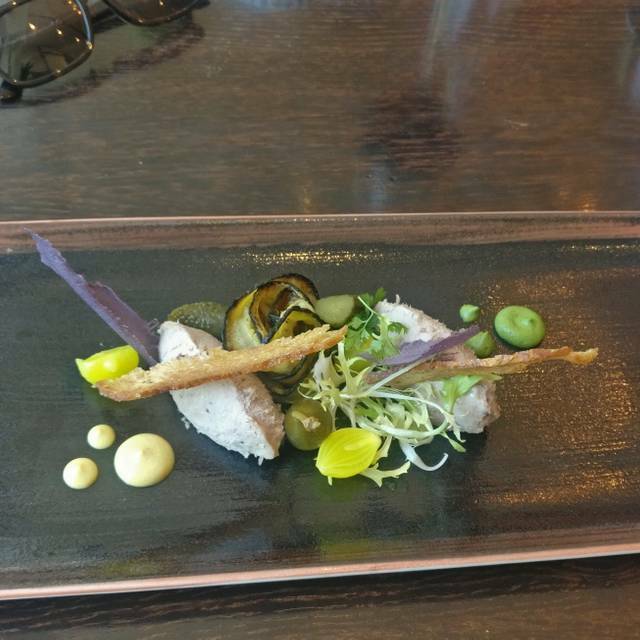 The menu was perfect, and the chef’s option allowed us to explore the chef’s personal style. Lovely restaurant and good service. Food was so tasty ! Enige punt van kritiek is het zitten op de bank. Een stoel is prettiger. Alles Lekker Dank Je! Really enjoyed the dinner. 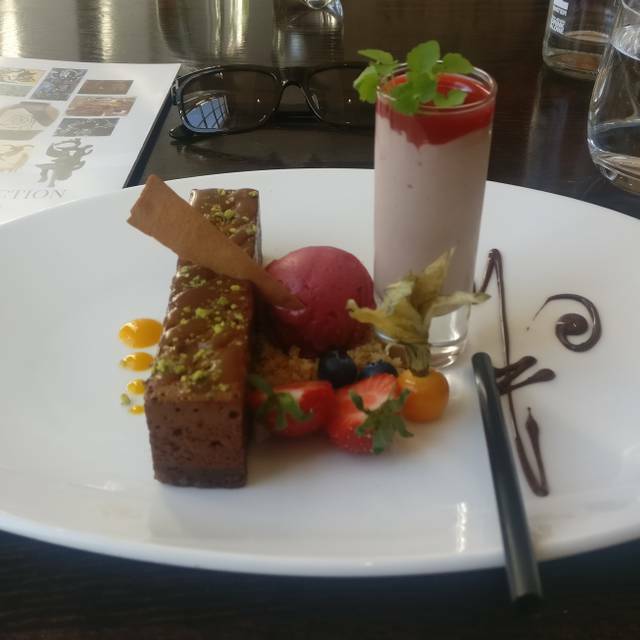 The food, presentation, atmosphere, creativity and service were all outstanding and memorable. I hope to come back soon. Het is al jaren mijn favorite plek aan de gracht waar ik met mijn familie en vrienden uit binnen-en buitenland kom. Y excelentes chefs y personal felicidades! Great place, fantastic food, wonderful service, uptight customers , which is not down to the restaurant! The service was excellent! The ambiance was excellent and the food was excellent! Food and staff were amazing! Would visit again. Beautiful setting and amazing menu. Everything was excellent! Great food and impeccable service. Truly a great meal. Brasserie Ambassade is as much a visionary delight as it is a sophisticated dining experience. The service is professional and friendly, and the collection of dining rooms allow for intimate seating arrangements. What a lovely place in Amsterdam. Right on the canal and part of a hotel that is subtle in the neighborhood. Great service and the food was excellent. We had an amazing time at this restaurant. First, as soon as my date and I got there we were welcomed very nicely. They promptly sat us down and were offered the menu. Service was impeccable and very attentive, they were always on top of everything, water, wine, bread, etc. 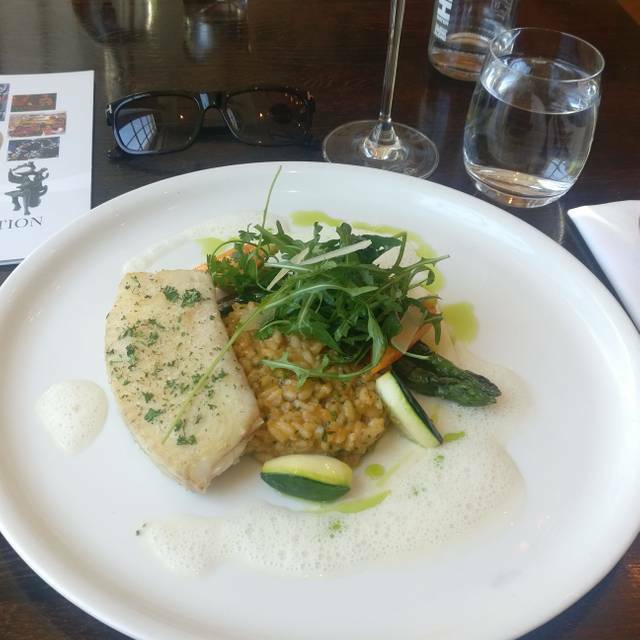 The food was amazing, superb quality food for the price, I had the duck confit and my beautiful date had the sea bass, delicious, they were cooked to perfection! I'm very glad I chose this place for our special dinner. Nice place, excellent food, perfect service. Beautiful dining rooms with original paintings on the walls. A canal view didn't hurt either. but food! What a great overall experience! The service at this restaurant was outstanding! We were waited on immediately, which isn't too common in the restaurants we went to in Amsterdam. We enjoyed a bottle of wine, and the food was outstanding. They brought over bread, and it was so good we got another basket of it. It was a quiet, beautiful atmosphere for enjoying good food and wine. My wife’s had their cheesecake for sweet and remarked it was the best she had ever eaten - and that’s a lot! Our waiter was incredibly knowledgeable and service oriented. Food and wine were perfect. A wonderful and relaxing experience. the portions were too small and it was very hot inside the restaurant. Wonderful find that we stumbled upon while walking through the neighborhood visiting Amsterdam!Our waiter was very knowledgeable about the winelist and took care of us! Exceptional cooking, friendly and knowledgable staff, cosy and relaxed. We had a dinner for three. The atmosphere is beautifully decorated. Even though, the restaurant was full, the sound level wasn’t too loud. We were able to have a nice conversation without raising our voices. We also loved our food. All three of us loved our starters and mains. The wine options were also very reasonably price. The service was very attentive without being over bearing. Overall, a great dinner. We would come back the next time we are in Amsterdam. We dined their for dinner and for lunch. 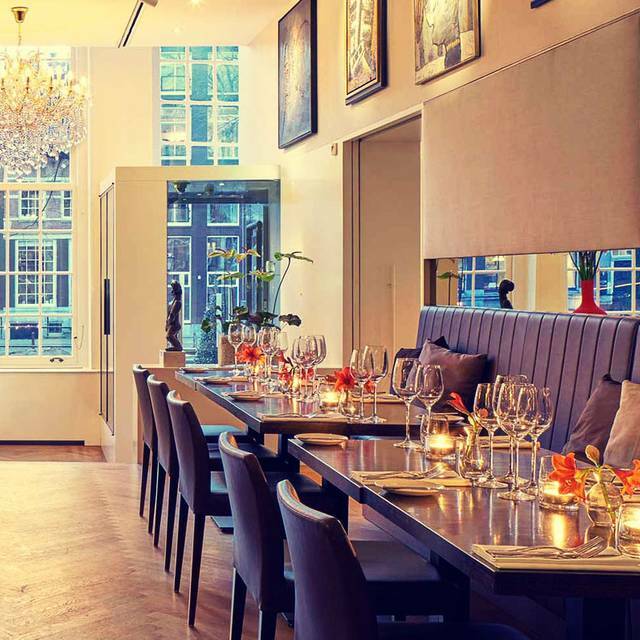 It is a lovely restaurant on the Herengracht canal, it is attached to and part of the hotel. The food service and ambiance are perfect. Our dinner and lunch were very good. The warmth, and friendliness of the waitstaff made it very special. They also have a very lovely library bar to be enjoyed. Servicio Perfecto! Comida perfecta! El postre delicioso! 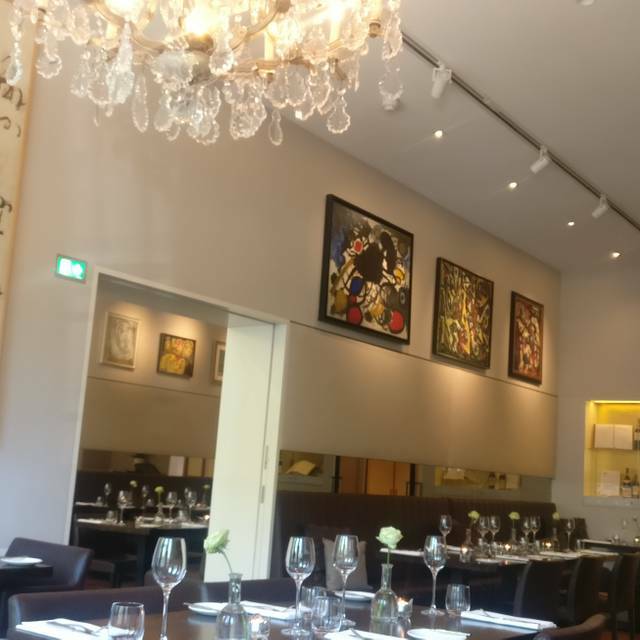 The Brasserie Ambassade is set in an historic canal building and decorated with paintings by the post-WWII modern COBRA artists. The food is delicious French cuisine elegantly served by knowledgeable wait staff. My husband and both had the very tasty crispy-skinned filet bar with asparagus, fennel, lentils, and saffron beurre blanc. 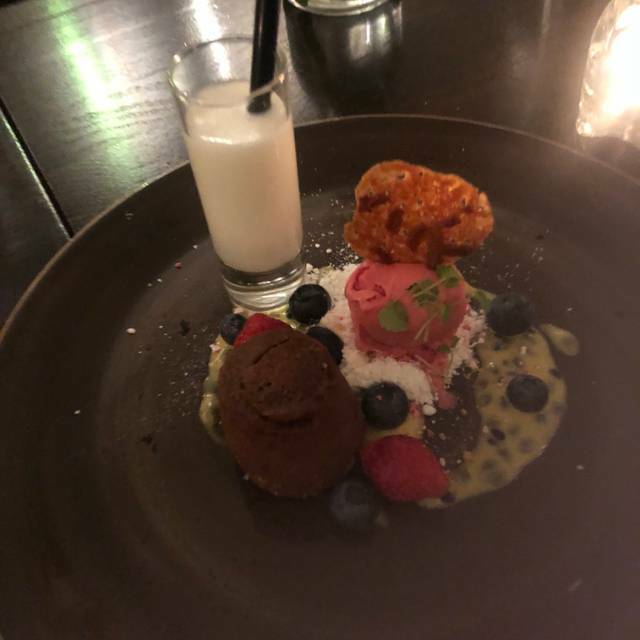 He started with the pâté de champagne; I chose the artichaut bargioule, and we finished with the intensely chocolate but light fondant au chocolate accompanied by warm cherry sorbet and a shot of coconut shake. As we were seated at a window overlooking the canal, we could people and boat watch while we dined. We saw a boat with a fully set table pull up for a few minutes and one of the waitresses take plates of oysters out to the couple onboard. One of the waiters told us that you can hire a boat for a private dinner. The boat stops at two or three restaurants for starters, the main course, and dessert as it makes its way along the canal. A progressive dinner on water! We would highly recommend this restaurant for the fine food, service, and friendliness of the staff. Our appetizer and desserts were phenomenal, if only the entree had lived to same standards. Overall a very beautiful restaurant, a bit pricey but very nice evening. Lovely restaurant to celebrate our wedding anniversary. All the staff were great, nice window seats and excellent food and wine! Thank you. Excellent food, very pleasant staff! Adam and I enjoyed everything about this meal. The art was fabulous as was knowing more about it. The wait staff was excellent; I wish I'd written down the name of the woman who waited on us as she was especially engaging and made us feel truly at home. 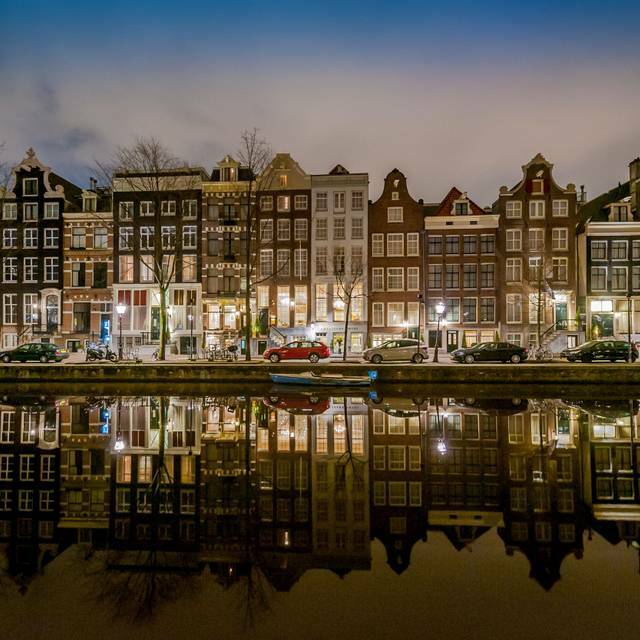 Had we spent more time in Amsterdam, we would have returned again.